Christmas morning was very busy at our house. We were opening presents and preparing the meal that would be eaten later in the day. I knew that there would not be a lot of time for breakfast, but being that it was Christmas morning I wanted something special. Last year for Christmas I made a French toast bake and it was perfect for breakfast, so I decided to make one again this year. I found a simple, but delicious sounding recipe on the web that I thought my family would enjoy. I have made a couple of French toast bakes with fruit so this time I decided to try one without the fruit. 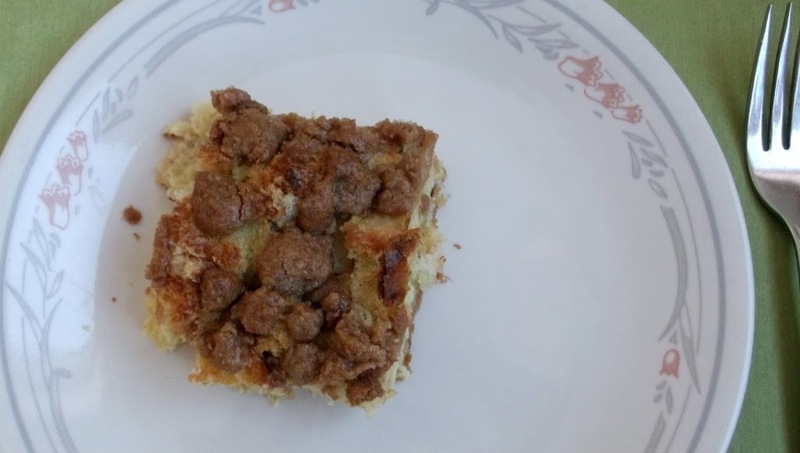 The recipe had a topping very much like you would put on top of a coffee cake and actually while eating the French toast I thought that it tasted somewhat like a coffee cake. You can top this French toast bake with your favorite syrup for a delicious breakfast. 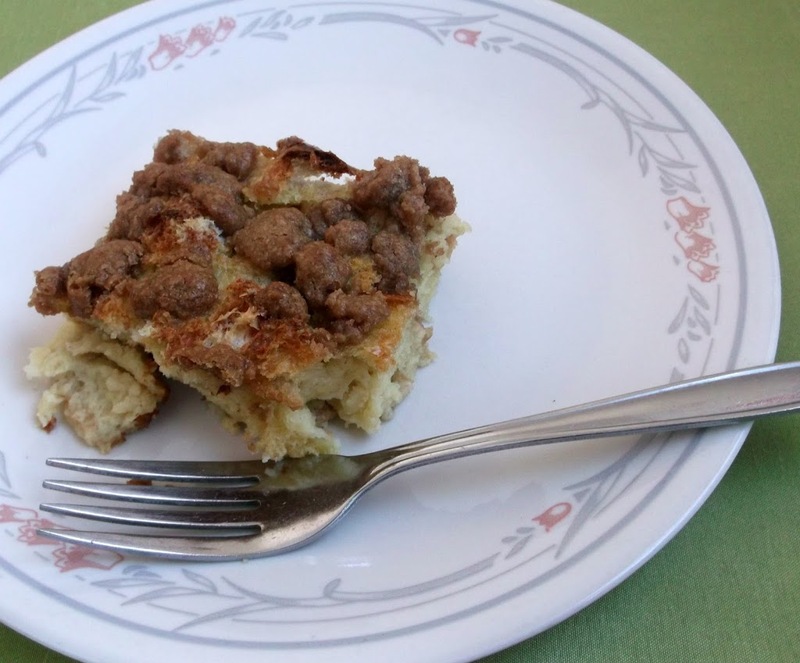 As always I love how simple these French toast bakes are, they make a delicious breakfast. The fact that you can make them the night before is one of the things that I love most about them. Grease 9 x 13 inch baking pan with butter. Tear bread into chunks and evenly distribute in the pan. Mix together eggs, milk, cream, sugar, and vanilla. Pour evenly over bread. Cover tightly and store in the fridge overnight. In a separate bowl, mix flour, brown sugar, cinnamon, and salt. Add butter pieces and cut into the dry mixture until mixture is pea size pieces. Store in baggy in the fridge overnight. The next morning preheat oven to 350 degrees F. Sprinkle the crumble mixture over top of the bread mixture. 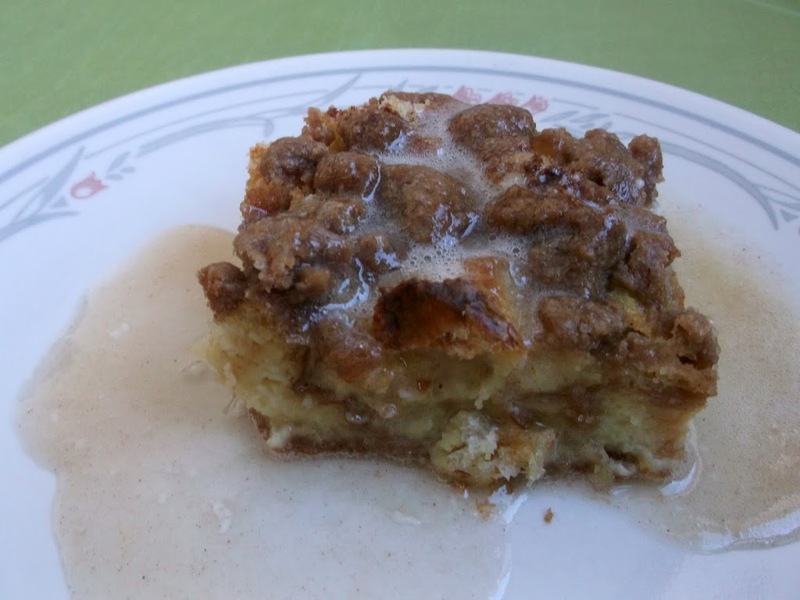 Bake for 45 minutes for a softer, more bread pudding texture or bake 1 hour for a firmer, less liquid texture. Cut into squares and serve. Top with your favorite syrup and enjoy!! Mmmmm….my family would love this! Perfect for any holiday or special occasion breakfast 🙂 Happy New Year! Happy New Year to you, Dawn! Great dessert – so nice for those times when you want something a bit different, but are pressed to time. I hope you holiday has been great, and Happy New Year! Your baked french toast must have been a big hit on Christmas morning. It’s WAY after Christmas, but I am absolutely making this. What a fun brunch dish! Thanks for taking the time to give such a yummy recipe!